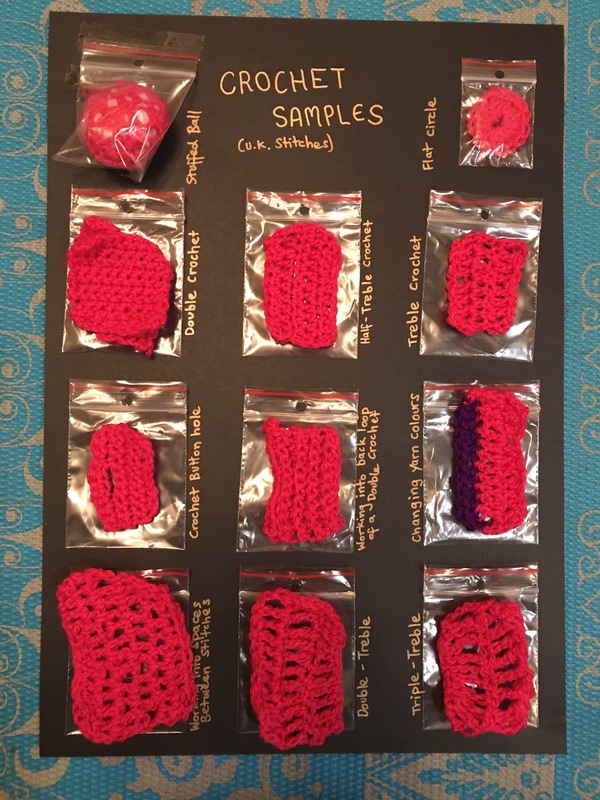 1st Draft Crochet sampler card for inclusion of my first year Textiles Portfolio at Fashion Design School. In case you didn’t get the memo, I’ve moved to Sydney where I’m now studying a Bachelor’s Degree of Fashion Design. 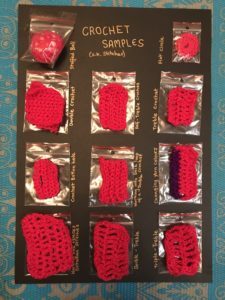 Anyway, this is about me learning to crochet… It’s awesome! And very relaxing- like a massage for my overstressed mind. (You should try it) I don’t know why I didn’t start learning sooner. But I quickly found that some of the instructions in the books seemed different to what I’d just learned on YouTube. After some quick Googling and wondering if I was losing my mind, I discovered that the U.K. and U.S.A. often use different terms for the same stitches (wwhhhyyyyy?!?) which makes things super confusing in a totally unnecessary way. (Thanks America). [amazon_link asins=’1409339815′ template=’ProductAd’ store=’spacefairy-20′ marketplace=’US’ link_id=’40bb9571-6bb4-11e7-9949-7bd4ab8177d0′] Anyway, once I’d gotten over that, I treated myself to this awesome book which has been helping me learn and build on the basics, in a highly visual and easy-to-follow way.